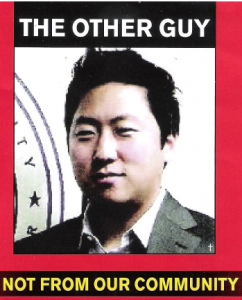 Image from a controversial anti-Choi, pro-O’Farrell mailer. District 13 candidate John Choi’s complaint to the District Attorney’s Office, filed earlier this month and made public last week, touched off the latest round of heated exchanges between him and opponent Mitch O’Farrell. They are battling to replace Eric Garcetti, who is running for mayor. Choi alleges volunteers for O’Farrell’s campaign are misleading voters in the Armenian community by making it appear that O’Farrell is running on a ticket with a candidate of Armenian descent, when in fact that candidate, Sam Kbushyan, did not make it into the May 21 runoff. Kbushyan has endorsed O’Farrell. The complaint, submitted by Choi’s attorney, also contends O’Farrell’s volunteers have been collecting vote-by-mail ballots and telling voters they would mail them to the City Clerk’s Office. The attorney also claims volunteers for O’Farrell’s campaign have been filling out ballots for voters, some of whom include residents at an Armenian senior home. O’Farrell responded to Choi’s accusations Friday with a “cease and desist” letter from his attorney accusing Choi of making “false and defamatory statements,” using copyrighted news stories in mailers, violating election and civil rights laws, and using false information to raise money for his campaign. He said Choi’s complaint was a distraction from policy issues affecting the 13th District. O’Farrell has accused Choi of being an outsider, saying he only moved into the district last year. Choi, who lived in Fullerton from the ages of 6 to 18, said he has been a resident of Los Angeles for the last 10 years, living in West Los Angeles, Koreatown and the downtown area. O’Farrell, who worked in Garcetti’s office, said he has lived in the district for 31 years. But Choi said O’Farrell only moved into the district last year after the district’s boundaries were changed. O’Farrell’s spokeswoman, Renee Nahum, said O’Farrell voted for four council members in the district. “Who did Mr. Choi vote for, if he voted at all?” she asked. “I’d thought by 2013 we would have moved past these … race-baiting attacks,” said Dana Moon Dorsett, president of the Korean Community Lawyers Association. “But putting a squinty-eyed picture with the colors of the Chinese flag and then calling the guy an outsider? The xenophobia here needs to stop. John has lived in the district nearly twice as long as his opponent. But what they’re really talking about isn’t how long he’s lived here; they’re just trying to make him look like a dangerous foreigner. Disgraceful. The mailer, which calls O’Farrell “the best successor to Eric Garcetti,” includes photos of the candidate with Councilmembers Bill Rosendahl and Tom LaBonge and a quote from Rep. Xavier Becerra. If elected, Choi would be the second Asian American and the first Korean American on the City Council. He has received support from Asian Americans statewide and across the country. The first Asian American councilmember, Mike Woo, served from 1985 to 1993, and also ran for mayor.